It’s summertime and young Dana Sculley has invited best friend Fox Mulder to a campout in her backyard. As they pitch their tent and darkness falls, strange sounds and shapes emerge. Dana has an answer for them but young Fox lets his imagination run wild. It doesn’t help that Dana insists on reading a story to Fox from a series of novels called—surprise!—The X-Files. Fox immediately suggests they sleep inside Dana’s parents’ home since the story was “scary,” while Dana laughs, insisting aliens aren’t real. “‘But the universe has thousands of planets,’ Fox argues. ‘So?’ Dana doesn’t understand his reasoning. ‘Here we go again,’ Dana moans. ‘And if ONE other planet sent a UFO to Earth . . .’ Fox persists. His argument is interrupted by a brilliant flash of light. Not so . . . it’s only the porch light Dana’s mother has turned on. Fox’s imagination, however, is now free and galloping madly off in all directions. Dana’s dog Buster casts a weird shadow. The excavation for the Sculleys’ new swimming pool becomes an alien footprint, and so it goes. Every fright and fear Fox manages to produce is shot down by his friend’s levelheadedness . . .
. . . and yet . . .
What’s that odd thing half-buried in the dirt beyond the trees, and who zipped up the tent flap they are certain they left open while they explored those weird sights and sounds? 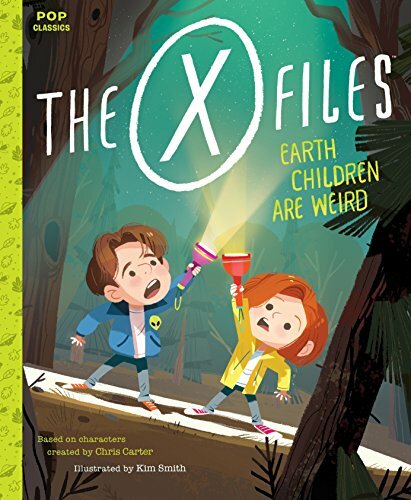 The conclusion of this storybook truly contains a comical, but definitely X-Files twist. Since its premiere in 1993, The X-Files, with its accompanying movies, graphic novels, and brief resurrection as a miniseries in 2016, has intrigued the viewing public and amassed a faithful fandom. This children’s story, based on the characters created by Chris Carter, will make fans of a new generation. With decorative end papers and illustrations by Kim Smith, its recognizable characters, and Jason Rekulak’s text, this story can be easily read alone by eight year olds, or by adults (who’ll enjoy the story, also) to read to those younger.